Overturned truck on Interstate 280 in Los Altos. 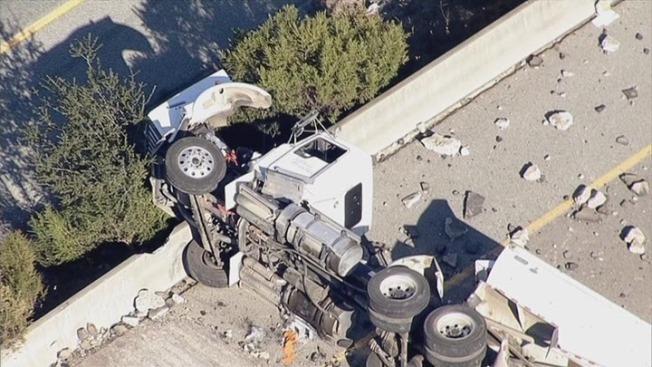 A big rig carrying gravel overturned on Interstate 280 on Monday during the afternoon commute, spilling debris and blocking four lanes in the southbound direction, according to the California Highway Patrol. The crash occurred just before 2 p.m. on southbound I-280 between Magdalena and El Monte avenues, the CHP said. One person was injured in the crash and transported to a local hospital, according to the Santa Clara County Fire Department. The crash snarled traffic at the start of the afternoon rush hour. CHP officials estimated it would until about 6 p.m. to clear the blocked lanes.